Last fall I decided I wanted to plant pumpkins. Lots and lots of pumpkins. I kept imagining a front porch full of them, so this spring I planted 4 different varieties. Fast forward a few months and I literally have pumpkins coming out of my ears. But, that’s not really a problem, is it? Especially for a heart that loves fall. And another reason having baskets full of pumpkins isn’t a problem? Fall tablescapes. That’s right, today I’m bringing you another fall table idea, only this time, it’s all about the pumpkins from my garden. 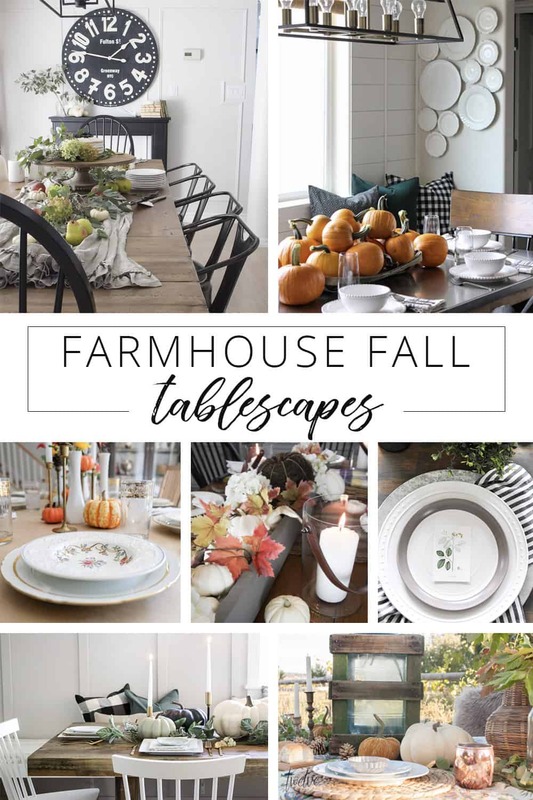 I’m so happy Shannon from AKA Designs asked me to join in on her fall tablescapes tour. Let’s get started, shall we? Since this fall table is all about pumpkins, I made them the entire focal point of the table. I’m not even sorry about it. And one of the best things about this fall table, is that it’s positively easy to put together. Especially if you have a garden full of pumpkins! I’ve also included links to most of the items below! Now, it’s time to take a peek at the other bloggers on this tour! More fall goodness to come! I LOVE your pumpkin-y centrepiece! We always plant pumpkins too and usually have no idea what to do with them all, but this year we only ended up having about three survive the cucumber beetles that attacked us a few months ago. Thanks for letting me enjoy your bountiful harvest instead though! I love the white and orange contrast. In fact, I wore white denim and an orange top today. I wish we could grow these in S FL. I do grow lemons. You created a wonderful fall table. Oh wow! I love this! I now know I need to get about a hundred little pumpkins to put on my table! Love they way to simply styles your table, it is so beautiful. Your style has evolved. I love this shade of blue with the pumpkins. You had that all planned for our viewing delight!!! Thank you.